Alex joined APHRC in 1998 (then a program of the Population Council in Nairobi) as a Senior Research Fellow. In 2000, he was appointed APHRC’s Interim Director and charged with the responsibility of leading its transition into an autonomous institution. Having successfully led this transition, he was appointed APHRC’s Executive Director in 2001, and has steered the institution to phenomenal growth to date. He is also the Director of the Consortium for Advanced Research Training in Africa (CARTA) and Honorary Professor of Public Health at the University of the Witwatersrand, South Africa. Alex holds a PhD in Demography (University of Pennsylvania, USA, 1993), Master of Arts degree in Demography from the same University (1991) and a Master of Science degree in Sociology (University of Ibadan, Ibadan, Nigeria). Prior to joining APHRC, Alex worked at ORC/Macro International where he provided technical assistance to governmental and non-governmental institutions in several African countries in the design and conduct of Demographic and Health Surveys. Alex has more than 25 years of experience working in the population and public health fields and has authored numerous scientific publications covering a broad range of fields including population and reproductive health, urban health, health metrics, and education. 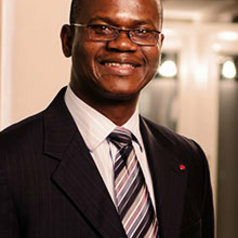 He also currently serves on the boards and committees of several international public health organizations including the World Health Organization, PATH, International Union for the Scientific Study of Population, University of Witwatersrand School of Public Health in South Africa, and the Wellcome Trust.